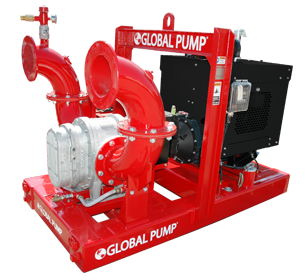 The Global Pump GST line handles a wide range of liquids from water and sewage, to sludge that can contain solids and other material with flows up to 16,000 gpm (3,634 m3/h) and heads up to 202 feet (62 m). Industry best in fuel efficiency, ease-of-maintenance, and durability. 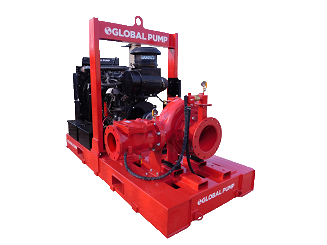 The Global Pump GHT line handles a wide range of liquids from water and sewage, to sludge that can contain solids and other material with flows up to 16,000 gpm (3,634 m3/h) and heads up to 261 feet (80 m). Industry best in fuel efficiency, ease-of-maintenance, and durability. Where efficiency and reliability are critical, our GSH model high head, high pressure pumps are superior for various applications including liquid transfer, wash down, fracing, and jetting with flows up to 6,750 gpm (1,533 m3/h) or heads up to 433 feet (132 m). Where efficiency and reliability are critical, our GHH model high head, high pressure pumps are superior for various applications including liquid transfer, wash down, fracing, and jetting with flows up to 7,950 gpm (1,806 m3/h) or heads up to 748 feet (228 m). The model GSCWP automatic priming wellpoint pumps handle the demanding requirements for wellpoint and underdrain dewatering applications. The model GSRWP positive displacement wellpoint pumps are capable of handling both water and air and automatically prime and reprime without air elimination systems or operator intervention. 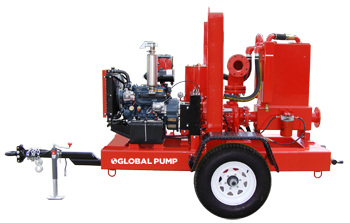 The model GSPWP positive displacement, double piston dewatering wellpoint pumps are capable of operating for long uninterrupted periods of time with high fuel efficiency and low maintenance. 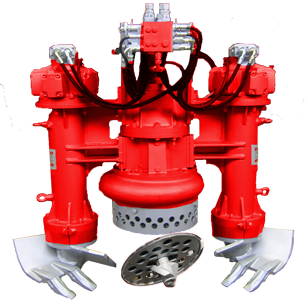 Global Pump Dragflow heavy duty submersible agitator pumps are designed for handling slurries with up to 70% solids content and specific gravity up to 1.7, with a capacity of up to 5,300 gpm at 275 feet of head (1,204 m3/h at 84 m). 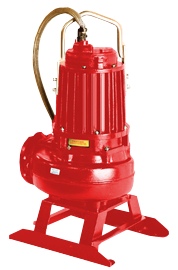 Global Pump portable electric submersible pumps are ideal for corrosive and abrasive applications. Ideal for low flow, high head applications. Available in models from 3" to 8" and 5 hp to 35 hp. 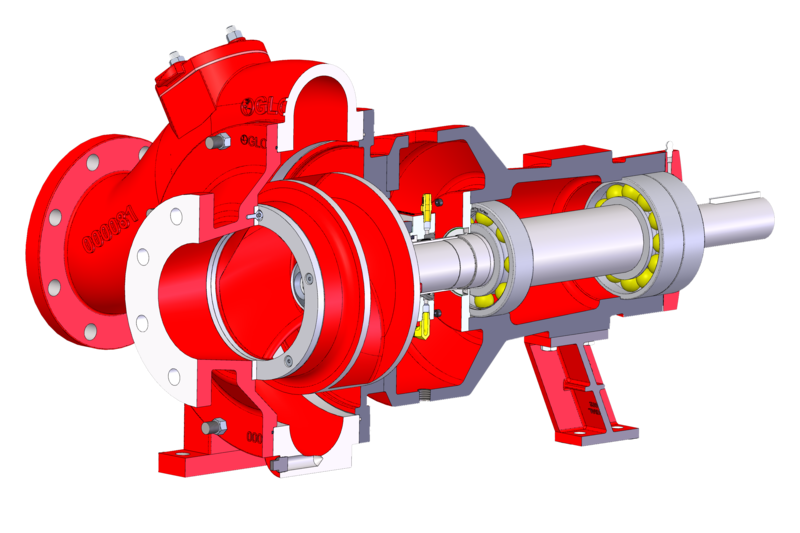 these pumps can achieve max heads of 270 ft. and 1650 gpm (82 m and 375 m3/h). Global Pump portable electric submersible pumps are ideal for corrosive and abrasive applications. Ideal for high flow, lower head applications. Available in models from 3" to 8" and 5 hp to 58 hp. these pumps can achieve max heads of 220 ft. and 2250 gpm (37 m and 511 m3/h). 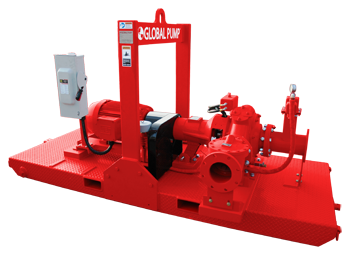 Global Pump portable electric submersible pumps are ideal for corrosive and abrasive applications. Ideal for low flow, high head applications. Available in models from 2" to 8" and 1.3 hp to 20 hp, these pumps can achieve max heads to 95 ft. or flows to 1717 gpm. (29 m and 390 m3/h). 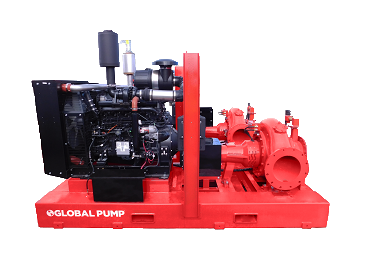 Thank you for your interest in Global Pump, your source for industry leading pumping equipment and accessories. 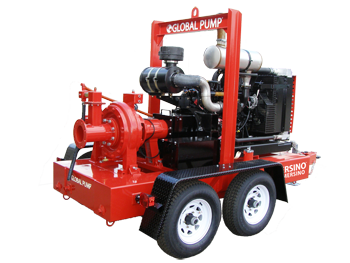 Global Pump's full line of electric or diesel driven pumps are available in a variety of sizes and configurations to meet your specific requirements. Our team can consult with you and design the most efficient solutions. Please browse our site and call or email if you have any questions whatsoever. 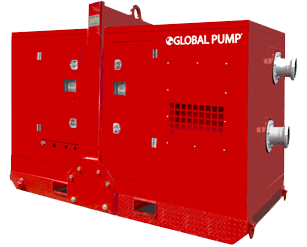 Click Ask Global Pump to put our decades of pump experience to work for you. If you need immediate attention call 866-360-PUMP. We look forward to providing you with solid solutions to your liquid problems.